In the past, straightening one’s teeth involved braces. Between having the braces installed, keeping them clean, and any feelings of self-consciousness, it’s no wonder that many believe that having crooked teeth was a preferential alternative. Invisalign is a new system a dentist can use to straighten a patient’s teeth while avoiding the discomfort and appearance of braces by creating customized aligning trays made specifically for your teeth. Invisalign is made of virtually invisible plastic and fits over the teeth. This teeth straightening process will gradually shift the teeth into place based on the plans of the dentist, who will place a new set of aligners in every two weeks until the process is complete. If you’re looking for a dentist who provides the Invisalign teeth straightening process, look no further than Princeview Dental, a teeth straightening dentist in Toronto. When you visit our conveniently located offices in the Kingsway in Etobicoke for the Invisalign procedure, we will do an initial consultation, take impressions to customize your trays, and put in your aligners at convenient times, all at an affordable cost. When you choose Princeview Dental as your teeth straightening dentist in Toronto, we will take x-rays, pictures, and impressions of your teeth. We will then send them to Invisalign, who will create a 3D image of your teeth, allowing us to better design your treatment plan. This will include the movement of your teeth and how your teeth will look once it is completed. We will also be able to show you the exact movement of your teeth during each stage. Please note that although the length varies from patient to patient, both adults and teens can expect the process to take approximately a year. Your teeth aligners will be designed based on a customized plan. The aligners are to be worn throughout the day, though removed when you are eating or brushing, and worn at night; the teeth straightening process will then gradually shift your teeth into place. In addition to avoiding the discomfort of braces, the aligners are virtually invisible, because they are made out of a clear plastic material. When you choose Princeview Dental as your teeth straightening dentist in Toronto, we will give you a new set of aligners every two weeks throughout the process. It is recommended that you keep the aligners in for 20 to 22 hours a day, as well as visit us every four weeks or so to check in on your teeth’s progress. When you’ve reached the end of your treatment, you’ll be ready to reveal your new smile to the world. Once your teeth are straightened–and even before that–we recommend maintaining an oral hygiene routine that includes brushing at least twice a day, flossing once a day, rinsing with an antiseptic mouthwash, and scheduling a cleaning and checkup at our offices every six months. 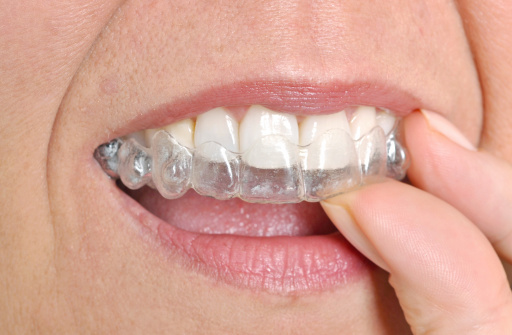 You may also require a cleaning more often during the Invisalign process. For more information on the Invisalign teeth straightening dentist procedure, contact Princeview Dental, a teeth straightening dentist in Toronto, today!